With family size shrinking, and extended family becoming more dispersed, it is not uncommon nowadays for people to have some sort of sleeping arrangement for their guests. It is less common to have a dedicated guest bedroom. For a lot of us the guest bedroom shares space with other functions, after all space is precious in these urban homes. These are some guest bedrooms from my Flickr favorites, they are proof that there is no reason why a shared space cannot not be as welcoming and stylish as a regular bedroom just because it does double duty as something else. 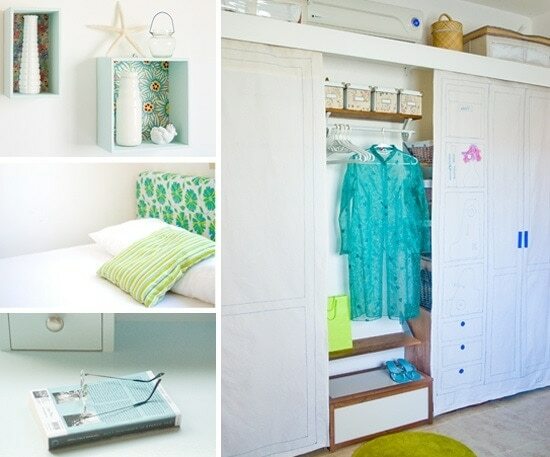 These are some small homes guest bedroom ideas. Click on any of the photos to see more from these Flickrites. Julie’s guest bedroom shares space with her husband’s home office. When not in use as a bed, the daybed resembles more a sofa, or a space to chill out a moment during work. This fabulous room, in my blogger friend Ivy’s home in Greece (I’ve featured her home before) doubles as studio and laundry room! The white sofa is an Ikea sofa-bed. This is a wonderful space that feels very welcoming. Anna’s guest bedroom shares the space with her studio. I love the cheery, colorful fabrics on the daybed. This is a great compromise that adds storage and a sleeping area all in one in this room that is office and guest bedroom. And when not in use supershoppertoo’s (whose home office I’ve also featured) guest bed is a great spot to unwind when taking a break from work. And this my own guest bedroom solution from some time ago. I was a single gal living in a small apartment, a sofa bed in the living room made for a handy space for visiting family members and for friends to crash after a late night out. How about you, do you have a guest bedroom? Or does it also function in another capacity? @ Kim:I am envious of that arrangement. When we lived in the city we owned an apartment very close to ours that we rented short-term. When we had guests that is where they stayed. It was very convenient, and it was in a perfect part of town for guests. We have a bed in our library (we have three rooms in our apartment; livingroom, bedroom and library) covered with a bedspread and with lots of pillows, were our guests can sleep. We currently have a dedicated guest room which is really nice (and it gets a LOT of use!) but we'll soon be building on a lot we're buying and the first phase of building will only have one bedroom. But not to fear! The property has a small, itty bitty, teensy weensy casita that we'll be turning into a guest house! How cool is that?! I'm so excited! As much as I love having company, I think it will be so nice to offer them their own, SEPARATE space (nice for them and us!). I love the way you use your spaces..very funky and creative! Great uses of space! I love how Ivy's guest room is also the laundry room! I'm fortunate enough to have a guest room only…although the closet is full of my things!